The beer taps will be open to the general public for the first time at the College World Series starting Saturday, part of a one-year trial that could lead to alcohol sales at more NCAA championship events. The NCAA will sell beer throughout the stadium during the 2016 College World Series. Organizers are planning on 400 beers per 1,000 people attending each game. OMAHA, Neb. — The beer taps will be open to the general public for the first time at the College World Series starting Saturday, part of a one-year trial that could lead to alcohol sales at more NCAA championship events. 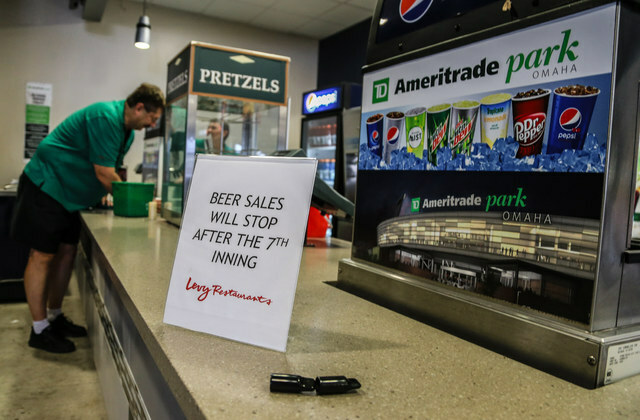 The NCAA’s decision to allow beer and wine sales in all seating areas at TD Ameritrade Park was made primarily in response to requests from fans and stadium officials and secondarily for the creation of a new revenue stream, managing director of championships and alliances Ron Prettyman told The Associated Press. Levy Restaurants, the concessionaire, projects 400 alcoholic beverages will be sold for every 1,000 fans, according to Kristi Andersen, spokeswoman for the agency that operates the stadium. With beers selling for $6 and $7 and wine for $8 and $9, and assuming attendance matches last year’s average of 22,000 per game, some $1 million in new revenue would be generated if the CWS went the maximum 17 games. Andersen said alcohol profits would be divided among the NCAA and other CWS stakeholders according to a pre-determined formula. Alcohol has been sold in premium seating areas at the CWS since 2013, when the NCAA relaxed its prohibition of alcohol sales at championship events. The new waiver to the no-alcohol policy, announced in January, covers a one-year pilot program that began with the recent Women’s College World Series in Oklahoma City. Prettyman said he heard of no problems associated with sales at that event, which ended last week. Prettyman said having alcohol sales throughout the stadium will allow officials to keep tabs on consumption and limit drunken behavior. The CWS has long been known for its festive atmosphere outside the stadium and tailgate parties in surrounding parking lots. “We feel if the people have an opportunity to have a cold drink of their choice inside the stadium, and we can monitor it and limit it and make sure that people are of age, that could be very positive,” Prettyman said. Andersen said stadium vendors must pass a test on serving alcohol and recognizing fans that have been over-served. A fan planning to buy alcohol must show identification at a wristband station and display the wristband at the concession stand. Each fan is limited to two alcoholic drinks per transaction, and sales will be cut off after the seventh inning. Last year, the Omaha police working outside the stadium on the 11 game days of the CWS made 19 arrests for driving under the influence and issued 42 citations for open containers and 16 for minor in possession. Owners of bars near TD Ameritrade Park said they were not overly concerned about stadium sales cutting into their profits. Kevin Culjat, owner of Lefty’s, said the main competition comes from the illegal drinking going on in the stadium parking lots before the games. Culjat said he doubts the availability of booze inside the stadium would, as the NCAA hopes, reduce the amount of alcohol consumed at tailgates. “People aren’t going to quit drinking in the parking lots because they can buy a $7 beer at the baseball stadium,” Culjat said. All bar owners interviewed said they expect the NCAA to keep stadium alcohol sales after this year. Prettyman said NCAA officials would review all aspects of alcohol sales at the WCWS and CWS before determining whether to expand sales to future championship events.